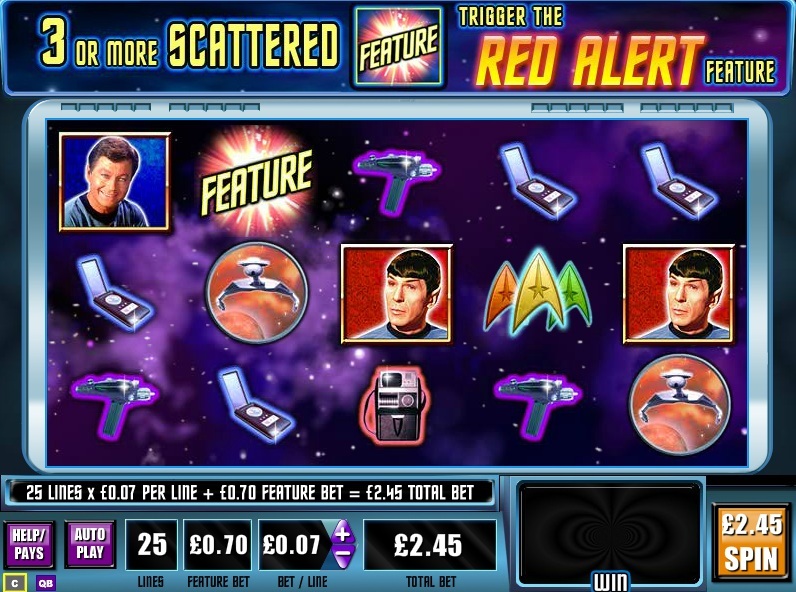 Slot manufacturer WMS has a major franchising deal with Star Trek, which has seen a steady succession of video slots based on the phenomenally popular US hit TV show. If you have played any of the Star Trek slots from WMS in a casino then you will probably know it is quite an experience. Most of them come with big seats that vibrate and shake, whilst sounds from the game come blasting out of the head rest. It’s more like being in a simulator than playing a slot machine. So when WMS announced in 2010 that they would be rolling out several slot games online, I initially thought it was going to be impossible to replicate this experience with the Star Trek games. To give WMS some credit, they have done a really good job with the Star Trek episodes, but they are still not as much fun as playing in a casino. 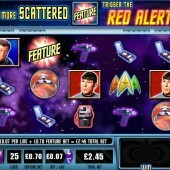 The first Episode online is Star Trek – Red Alert, which is available to anyone playing at an online casino supporting WMS games. Further episodes (slot games) are unlocked by achieving awards along the way – one unlocks the next, with five episode currently available. In Red Alert you get a series of what I would call mini-bonuses, which generally add a multiplier or extra winning symbols to the reels . The main feature is the Red Alert bonus round, which is triggered by 3 or more feature symbols on the reels. You spin the reels and earn multipliers of between 2x – 15x on winning lines. If you don’t get a winning line then you lose a shield. You start with 5 shields and the bonus comes to an end when you lose all them. These can be 'powered-up' by seeing 3 or more ‘shields 100%’ symbols in one spin. Despite the Star Trek online slot games lacking the same user experience that you get in a casino, they are still very entertaining. I quite like the fact you have to earn rewards to open subsequent games, like Star Trek – Explore New Worlds and Star Trek – The Trouble with Tribbles. However, this could also be seen as a way of getting players hooked on slots, which I don’t think is such a good idea. If you are wondering why IGT also have a Star Trek slot, this is because they have a deal with the movie franchize and WMS have the licensing for the TV show.